Last week we talked about the new mechanics that Zariah the Summoner brings to the game. Now it’s Halden the Unhinged’s turn to show off his own brand of mystical mayhem! Halden is a freaky fellow who communes with the dead and carries out their last wishes. He is sometimes a solo adventurer, but when the party needs an interpreter for the departed (recent or otherwise), there’s none better. It’s also fortunate that he arms himself with powerful Totemic Magic that helps him deal with his foes in a variety of interesting ways. Halden can overwhelm his opponents like a millstone grinding wheat or can hold off and finally swing for the fences with one titanic blow! Halden will literally dominate the board with his 18 different Totems! 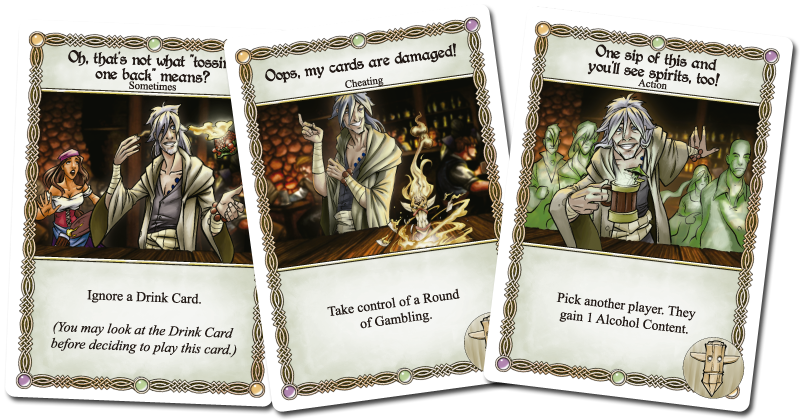 Each turn Halden will reveal a Totem card. He can accelerate this pace by playing specific cards from his deck. Each Totem is ineffective on its own, but once he amasses enough of them, they can combine their power into a Totem Combo! This massive Totem Combo can hit up to two different players for 1 Fortitude Loss, another player for 1 Alcohol Content Gain, yet another player to pay you 1 Gold and even summons a new Totem to get you started on the next combo! Share the pain across the heroes or dump it all on one, the totemic power is yours! Unlike most characters, Halden can do two things during his Action Phase: he can play an Action Card like normal as well as use a Totem Combo! Halden may play his Totem Combo either before or after his Action Card, giving him the flexibility to improve his hand before acting, or fish for totems before comboing. This is important, because Totems only work in specific ways, and they come in three varieties! 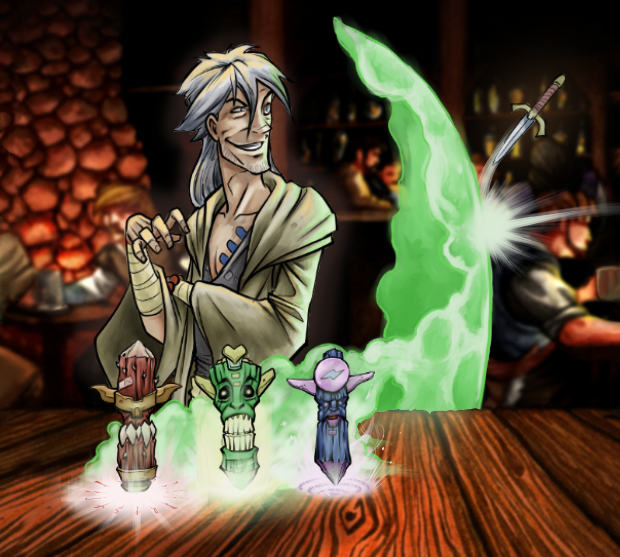 To create a Totem Combo, Halden chooses any or all of the Totems he has revealed and lays them out left to right. As long as a Totem is followed by a Totem that matches the resource type, it activates. If Halden holds off, he can activate Totem Combos with a dozen or more components! Each Totem that activates in the Combo can have its own target, or be piled all on the same player. But watch out! A player only needs to play a single Ignore card to avoid the entire Combo! Lastly, with no Totem to its right, the final Totem in a chain always fizzles and does nothing. So, do you wait to maximize the output of your combos with as many cards as possible, and risk your opponent ignoring them all, or do you burn up your Totems in short two or three card chains to get through their defenses? The choice is yours! Halden the Unhinged is due out this Fall (Novemberish) along with Wrench, Zariah and The Red Dragon Inn: 5. Get a jump on your friends and check out his complete rules here (PDF, 2 MB).